Sega-16 – E3 2006: Sonic’s Rebirth? One of the bigger Sega announcements this week has been the flood of info regarding the newest Sonic title. After several hit-and-miss outings over the last two hardware generations, it seems that the famed hedgehog is slated to make a comeback. Just this past week, Sega revealed many of the details surrounding the still-nameless adventure, giving gamers full view of the game many hope will return the franchise to prominence. It’s funny how Sega could let its star mascot fall on rough times like it has. Shadow the Hedgehog, Sonic Heroes, not a lot there that’s truly memorable, is there? It seems that while Sonic has managed to keep pace with newer characters on the DS and GBA, his 3D adventures haven’t found their footing yet (not a good thing for a series centered on speed). Many gamers feel that the original Sonic Adventure was as good as it’s gotten in the third dimension, so a lot is riding on this newest entry. Once again, our little hero is tasked with stopping the evil Eggman from capturing Chaos Emeralds, this time one particular gem that’s in the hands of newcomer Princess Elise. He captures both the girl and the emerald, leaving Sonic to play savior once again. Hey, it’s not like he’s not used to it, right? All the familiar faces return, including Shadow, who’s gone from a character everyone wanted to see to one most would like to avoid. Yes, he’s playable and drives and shoots. That’s his shtick, remember? What’s still unknown is whether or not this will be another fetch quest where you play as Sonic once every three levels or so, but the trailers I’ve seen suggest that this is mostly Sonic’s gig. Next Gen Sonic boasts a return to what made the character so famous in the first place: speed. As the trailer shows, the camera is much closer to the ground this time out, which conveys that great feeling of zipping along with the wind at your heels. Along with the familiar cast is a new character named Silver. 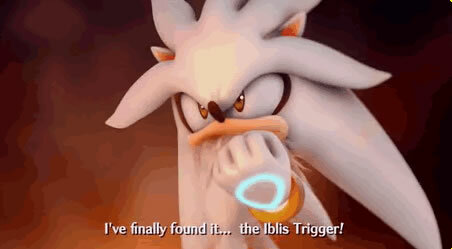 He’s a hedgehog, like Sonic, and is apparently searching for the Blue Blur (who he refers to as the “Iblis Trigger”). Exactly who he is and what he wants with Sonic remains a mystery, but he’s got some slick powers and he’s playable! Click on the pictures below to enlarge! The first thing noticeable about the next gen Sonic is that it’s divided into two types of gameplay: the adventure stages and the town. Sound familiar? 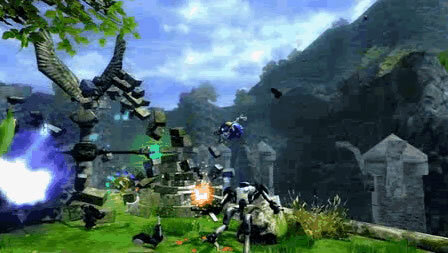 Just like Sonic Adventure, players will be able to explore a hub-like city and talk to the townspeople. Hopefully there will be plenty of secret areas with neat little power ups like before. Though not much, it added some much-needed intrigue to what would have otherwise been nothing more than just the space between levels. And what levels they are! 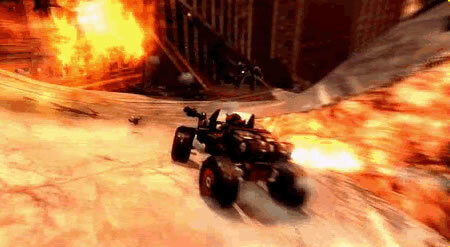 Several stages are shown throughout the trailer and look gorgeous. Rubble-lined streets make up Shadow’s level, while Sonic is shown dashing through a lush, tropical setting littered with waterfalls. The amount of detail is highly impressive, but expect the game to get even prettier before its release later this year. Sonic fans have both Sonic Rivals on the PSP and this latest game on both the Xbox 360 and Playstation 3 to look forward to. If this latest attempt can capitalize on all the good qualities that the first Sonic Adventure had and mix them with all the classic Sonic goodness that is still alive and well in such games as Sonic Advance and Sonic Dash, then there’s no reason why this newest entry can’t be the best game in the series since it went 3D. Even more interesting is this week’s announcement of the Wii-exclusive Sonic Wild Fire, a game based around the classic Arabian Nights tales (don’t ask; your guess is as good as mine), that’s supposed to make great use of the console’s innovative new controller. That means that there are two games for next gen consoles, as well as portables, and the year is still young! Yep, there are plenty of new titles in the works, which paints a pretty bright future for Sega’s little wonder. It’s good to know that even as new hardware looms, Sonic still manages to outrun retirement. Let’s hope he doesn’t lose his stamina this time out.